A whimsical yet compelling tale in which the fates of an unlikely duo collide, “A Dolphin and a Pilot” by Steven Lane Smith shows how two simple acts of compassion and kindness form an irrevocable bond of trust and friendship. Flash is a young Pacific Bottlenose dolphin with a dream. The best acrobat in his pod, Flash craves the applause and admiration of humans and hopes to be world famous one day as an entertainer for Aqua World. Against the advice of family and friends, Flash leaves his pod on a 15,000 mile quest to fulfill his dream. Flash bravely navigates through many of the perils in the ocean, but a treacherous encounter with an unruly group of humans leaves him wounded and vulnerable. Will he make it to Aqua World or should he return to his pod? Jon “Skip” Roper is a fighter pilot based at Osan Air Base in Korea. With just hours left of a week-long simulated air combat mission, the control panel in his F16 illuminate. As the systems begin to fail, Skip realizes his only chance for survival is to eject. Injuring his right hand in the process, Skip makes it to his survival raft, but his troubles aren’t over yet. With only a protein bar for sustenance and one container of drinkable water, he is exposed in his tiny one-man raft, in a sea full of danger and no land in sight. Without giving too much away, Flash and Skip come together briefly at a couple of critical points in the story to teach lessons in mercy and relationships, and restore hope and faith in goodness and humanity. A tall order for satirical fiction! I’ve read a few novels by Steven Lane Smith and love his story-telling technique. He has a clear, distinctive voice and his clever wit shines throughout the story. His humor is often so subtle that many times as I was reading one page something he said on an earlier page suddenly clicked. Skip Roper – ha! Most of the time however, the writing is just flat out hilarious, especially the dolphins’ take on things. For example on page 37, “I know what my life’s work is going to be! I’m going to entertain humans in captivity!” Flash’s obsession and obvious ignorance of what being in captivity actually means provides for some serious laugh-out-loud moments. Not limited to humor, Smith can also write some agonizing drama. In this particular story the author’s background as a former fighter pilot provides a completely authentic experience. One can actually feel the exhausting, painful ordeal Skip Roper goes through when he becomes stranded on a tiny survival raft through the author’s expert portrayal of the events. 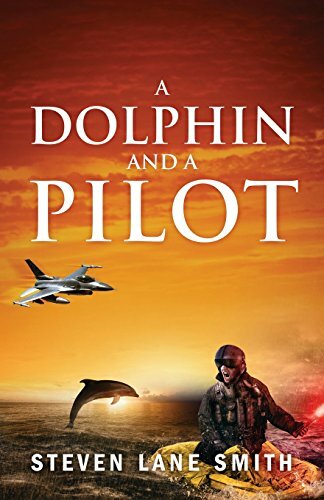 Fans of satire, action and adventure, and general “feel good” stories will enjoy “A Dolphin and a Pilot” by Steven Lane Smith. It is such a fun book to read and a thoroughly enjoyable experience that I highly recommend.